The latest trend in Russia, has a number of journalists writing on their own on the Internet, without intermediaries in the shape of investors, publishers or editors. Initially financial rewards are traded off for editorial independence. 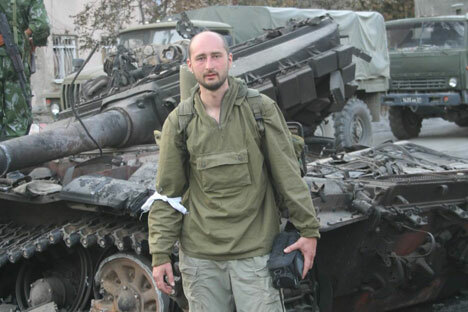 "Journalism without Intermediaries" is the title of a project launched by military correspondent Arkady Babchenko. Previously, Arkady worked for various publications and made content for Russian TV. But at some point he decided that independence was more important and now he is his own editor. In his blog, Babchenko publishes reports from various conflict zones and covers current affairs in an uncompromising manner, from an unofficial point of view. Readers make voluntary payments for reports that they like. Babchenko's blog is hosted by the LiveJournal platform, although it is not a blog in the conventional meaning of the word, where users post pictures of their meals and check themselves into trendy cafés. Babchenko says: "Blogs have turned out to be a very good format. They offer a free creative space that I need as a journalist. I do exactly what I want and how I want it. “I don't have to worry about the editor, wondering whether they will like my text or not; I don't have to worry about the web design editor whether they will include this or that picture or not; I don't have to worry about the duty editor, wondering how much space they will give me, a column, half a page or a double page spread; I don't have to worry about proofreading and can describe an event in a language that is right for that particular event." There are increasing numbers of resources like this in the Russian Internet. Many news stories, primarily those to do with political activism or social injustice, reach readers not via official channels but through public activists and journalists who address their audience directly, without any intermediaries. However, not many of them manage to break even. One of these projects is the magazine postrane.info. It is no longer just a compilation of authors' publications but an attempt to create a full-fledged mass media outlet. Its editor in chief, Irina Matyushonok, explains: "Po Strane was born out of another publication of mine, which suddenly lost its sponsors. I changed the title and tried to fund the publication with readers' money. In effect, Po Strane exists thanks to donations from the audience. This model is still very unusual for most users, so we have to contribute from our own paychecks. But you know, people are increasingly prepared to pay for well-written material, all the more so since there aren't that many alternative media outlets in Russia that write about small and medium-sized businesses. The idea will live on since I am sure that the future of the mass media lies in a collective payment model." There are different payment models in addition to the one whereby each specific piece is paid for by a grateful reader. There is also crowdfunding, when money for a specific project is collected through small contributions from many parties. This option was chosen by the well-known current affairs and cultural news Internet portal colta.ru. In May 2012 the portal (which at the time was called Openspace) lost the support of its investor. The editorial team got ownership of the content, set up a new site and tried to raise money through crowdfunding. Yet, despite being one of the most popular culture publications on the Russian Internet, the portal was unable to fully cover its costs through this funding model and had to seek sponsors and investors once again. Unfortunately, the majority of projects like these are not yet able to operate on donations alone. Yet everybody we spoke to insisted that they were interested in this working model since it gave them editorial independence. Journalism without intermediaries is not a business. It is a form of existence and self-expression, which – if you are lucky – may also generate some profit.